Halloween is around the corner with scary masks, those things that go “bump in the night” which frighten us to our very core. When it comes to scary things…there are many hazards that can bite at any given time. 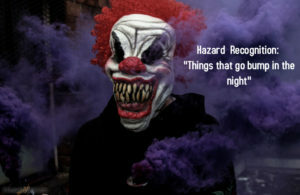 In every facility or worksite lies the infamous hazard seeking to take ones extremity or life in a second. So why is it hard for employers, employees to identify the hazards prior to an accident? Is it the lack of training, walkthroughs, or lack of engagement? As management do we know the top five hazards in the workplace? Overall Safety– General Duty Clause: requiring employers to provide a workplace that is free from recognized hazards that may cause death or serious harm to their employees. Chemical Hazards: Workers exposed to substances that may cause severe burns, may react when stored with other chemicals, flammable gases or liquids that may explode. Biological: Bloodborne Pathogens (BBP) Illnesses such as HIV, Hepatitis B and C, mold, fungi, or animal droppings. Physical: Noise levels above the 85DB, fall from heights, radiation, extreme hot and cold temperatures. Ergonomics: Repetitive work, the type of work, or a certain position strains the body (MSD’s Muscular Skeletal Disorders). This is the most difficult hazards to spot because problems build up over time. How do those eliminate hazards? Employee Training: What are the hazards of the job task performed? OSHA compliance training. New employee safety orientation. Standard Operating Procedures (SOP): Employee’s guide on how to perform those job tasks correctly and safely. Safety Assessments (JHA/JSA): Analyzing site location, description of the task, hazard description, hazard controls. Employee Involvement: Involve all employees in the safety process. Hazard Reporting System: Employees report unsafe equipment, or behaviors that may cause injury. Accident/Near Miss Investigation: Investigate the incident find the “Root cause” and take corrective measures. Corrective Action: Once hazards are identified, action must be taken to effectively correct the hazard. Eliminate those bloodcurdling, horrific hazards today so they don’t bite tomorrow.